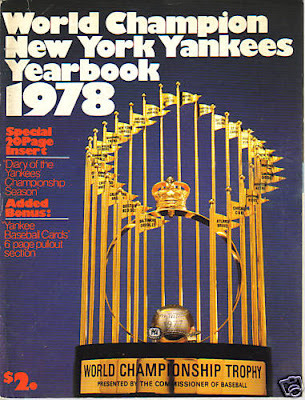 Mike Aronstein, founder of card publishers SSPC and TCMA, turned his own baseball and business acumen into a wide variety of sets between 1970 and 1979--major league, minor league, historical, and artistic--but none larger in scope than today's "Baseball Yearbook" collection of magazines that ultimately covered ten cities and 270 cards (at exactly 27 per team, for reasons explained below). 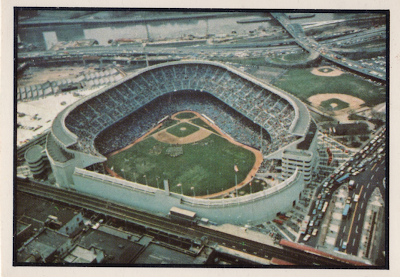 The Yankee version includes this aerial view of their original House That Ruth Built as #5. SSPC scored a coup by leading off 1978 with this profile of the defending World Champions, who beat L.A. in 6 games for their 1977 title. 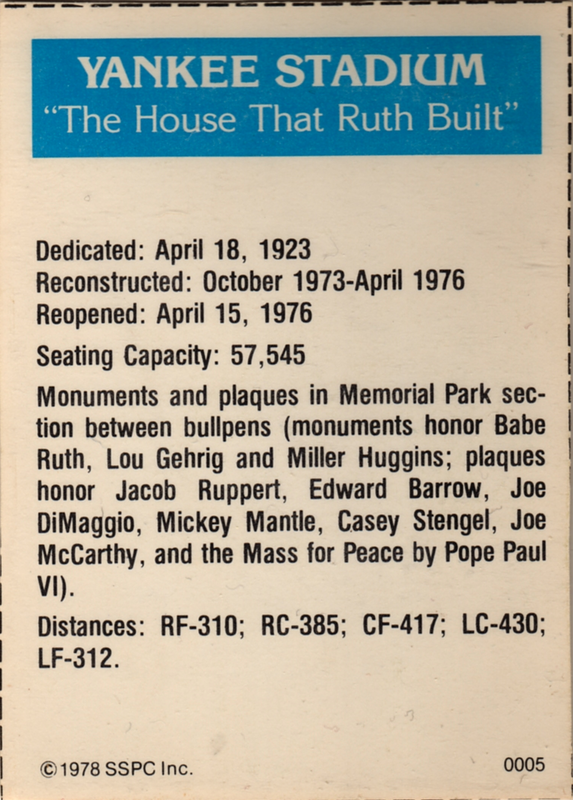 Just two years prior, Topps successfully stopped Aronstein and SSPC from selling a league-wide 630-card set by mail order (1976 SSPC #5 profile), claiming an exclusive right to show active players on cards. Their legal footing was murky at best, but I assume Aronstein backed off to avoid an expensive fight in the courts. So how did he change tactics for 1978? This yearbook features two important changes from SSPC. First, what the cover calls 6 pages is actually 27 double-sided cards as a 3-panel gatefold. It includes 24 players, manager Billy Martin, a team photo, and today's stadium shot. 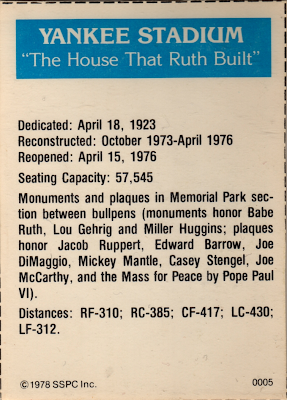 (Thus, buyers didn't get real "cards," but could easily cut them apart with scissors.) Second, they licensed both MLB team logos and MLBPA player images, so Topps couldn't use baseball itself as a legal wedge. This combo proved distinctive enough to avoid another legal challenge, or at least one that could stick. Check out the Mark's Ephemera blog for a nice profile of the Topps inserts at Topps Cards in Dynamite Magazine, and don't miss the Jimmy J.J. Walker's DY-NO-MITE cover, which is priceless. Keith Olbermann, long-time card collector and former SSPC editor, included significant details from this era in his recent blog tribute to Chuck Tanner. It's quite a read, if just for the mental juxtaposition of "tentative young photographer" with his strong TV personality. Should I ever be lucky enough to meet or speak with Keith, I'd love to learn more about those years working with Aronstein at SSPC. I tracked down this yearbook and bought it, even though I hated the Yankees, just because I knew there were cards in there. Still have the set. Exclusively cut by a 12-year-old. Very cool, one owner since 1978? I get tempted when Dodger versions come around--noticed this eBay one for under $10 the other day. Hi Mike, what a nice surprise. Thanks for your work in what ultimately opened collecting up to more than one company. Keith Olbermann wrote enough about your time working together that this post's legal sequence with Topps made sense--any details that you'd add? Interesting that you have a new project for the National--now I'm doubly looking forward to Chicago!